Yes I am still alive. I have been travelling a lot recently so not had time or opportunity to write. I am back in Hong Kong now and hope to keep my feet on the ground for a few weeks at least. Today I got this in my mail. Actually a few copies plus the most wonderful presentation pack I have ever seen. Congratulations to Hong Kong Post, they really do set a standard that others cannot meet in my view. A few weeks ago I went to an exhibition Hong Kong Post put on in Kowloon, TST. 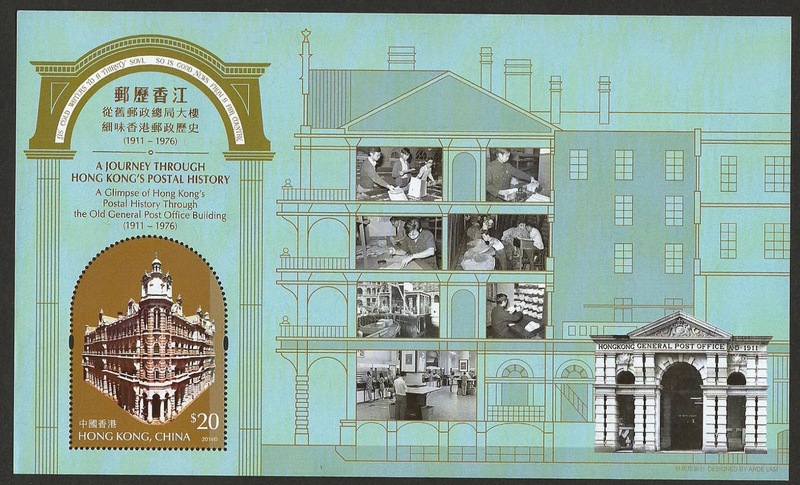 It was a titled a Journey through Hong Kong's Postal history - a Glimpse of Hong Kong's Postal History through the Old General Post Office Building ( 1911 - 1976) Really excellent and informative displays. I ordered these Sheets and a few other items while there and here they are. Hope you enjoy seeing this. The $20 stamp is in the left hand corner. Click image to enlarge to see more detail. I won't write more just now. Maybe in another blog.